There are three trolley lines: blue, green, and orange. The Blue Line operates from the US-Mexico border at San Diego/San Ysidro and runs to Old Town, via Chula Vista, National City, and Downtown. The Green Line travels from Old Town east to Santee, via Mission Valley and SDSU. The Orange Line connects the eastern cities of El Cajon and La Mesa with Downtown (generally not as usable for tourists except for getting around parts of downtown). Trains run from at least 5AM-12AM every day. Frequency varies, but the trolley usually runs every 15 minutes, with service reduced to every 30 minutes for late-night, weekend, and holiday service. Standard one-way fares run from $1.25 to $3 depending on how far you travel. Tickets have to be purchased from the vending machines at the station before you board the train. There's no formal system to check if you've purchased a ticket, but there are trolley guards that may come around and ask to see your ticket, and the fine is normally around $120 for not having a ticket. 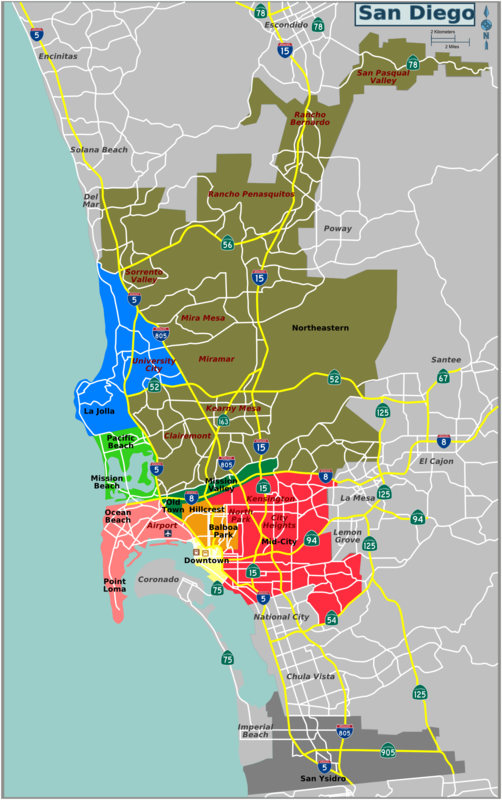 San Diego is a city on the Southern California seacoast, the second largest city in the state with 1.3 million residents. It is known for its ideal climate, miles of beaches, and location on the Mexican border, right across from Tijuana. It has a rich heritage built around sailing and is home to the Pacific Fleet of the United States Navy. It is also well known for its part in the wildlife conservation movement, being home to a SeaWorld theme park and the "world-famous" San Diego Zoo and Safari Park. The shuttle will run for 14 weeks over the summer, from Memorial Day through Labor Day weekend. Shuttles are clearly marked, adorned with the Big Bay logo. Rides on the shuttle are also included in the cost of parking at the Port's public parking facilities at the Hilton San Diego Bayfront Hotel, the Convention Center, and Navy Pier. Users of these parking lots may request their shuttle tickets from the parking attendant. For $1, visitors can hop aboard the Big Bay Shuttle for a six-stop ride along the bayfront that will connect Harbor Island to the South Embarcadero, near the San Diego Convention Center. The $1 ticket price also allows riders on and off privileges for the entire day. Tickets can be purchased at any of the sites listed above. Hours: Sunday – Thursday: 10 a.m. to 8 p.m.; Friday – Saturday: 10 a.m. to 10 p.m. The shuttle is being operated in partnership with Ace Parking. At least one shuttle will be ADA compatible. Following this summer's trial run, Port staff will evaluate the program's success and plans for a long-term service to commence operations in the summer of 2013. The terminal is conveniently located in downtown San Diego and a short distance from countless attractions. Nine cruise lines call in San Diego including Carnival, Holland America, Celebrity and Royal Caribbean. Note: Carnival will no longer home port in San Diego beginning April 2012. Here you'll find an expansive campus of museums, parks, gardens and arboretums. Neo-classical Spanish architecture, flowering gardens, a beautiful clock tower and intriguing museums make visiting Balboa Park a must. Possibly the premier zoo in North America, the San Diego Zoo encompasses over 100 acres of displays and habitats. 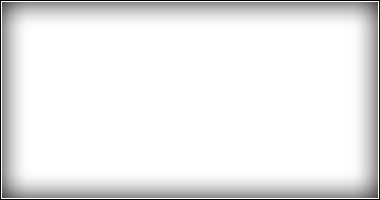 Animal shows run constantly, and there are creatures here that aren't visible in any other zoo on the planet. Located in Balboa Park. An upscale coastal community of San Diego, La Jolla includes secluded coves, beaches and ocean cliffs to explore. There are dozens of coffee shops, restaurants and high-end shopping outlets to be explored in La Jolla. This area includes preserved buildings and icons of the Spanish heritage of San Diego and the Old West, from 19th century cannons to the haunted Whaley House. Shopping and restaurants dot this historic district and living history performances regularly take place. San Diego Maritime Museum and the USS Midway Museum. 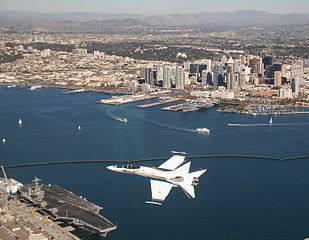 From the high vantage point of Pont Loma visitors can get a panoramic view of the Naval Air Station, downtown San Diego, the Coronado Bridge and the distant mountains. The lighthouse is a short walk and allows stunning sunset views of the Pacific Ocean and off-shore islands. Cabrillo National Monument commemorates the landing of Juan Rodriguez Cabrillo's expedition for Spain of California in 1542. Sea World San Diego allows visitors a chance to interact with aquatic animals in an exciting way. Through shows, displays and enclosures people can learn about the worlds oceans and the creatures that inhabit them. Located in Coronado, this hotel was constructed in the late 1800's and is located at the beach. Offers high class shops and service on one of San Diego's most beautiful and clean beaches.